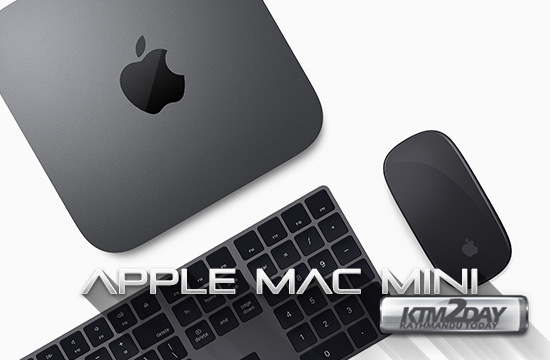 Apple at its October 30 event in New York, apart from unveiling the all-new MacBook Air, also launched all-new Mac mini. As was the case with the case with the MacBook Air, the Mac mini hasn’t seen a design refresh in years – since 2014 to be precise. Apple says the all-new Mac mini offers five times the performance as previous generations, up to 6-core processors, apart from more memory capacity (up to 64GB of RAM), and all-flash storage. Like the new MacBook Air, it comes with the Apple T2 Security Chip, which instead of enabling Touch ID here, provides on-the-fly data encryption amongst other features. Apple also launched two new iPad Pro models at the New York event. The all-new Mac mini starts at $799 (roughly NRs.95,000), and is up for pre-orders today in the US. It will go on sale on November 7 – which is the same date the all-new MacBook Air. No India availability or pricing has yet been detailed. The Mac mini like its laptop cousin is also the first in its series to be made out of 100 percent recycled aluminium that gives it a smaller carbon footprint – nearly 50 percent less than the previous generation. There is also a brand new air flow cooling system. 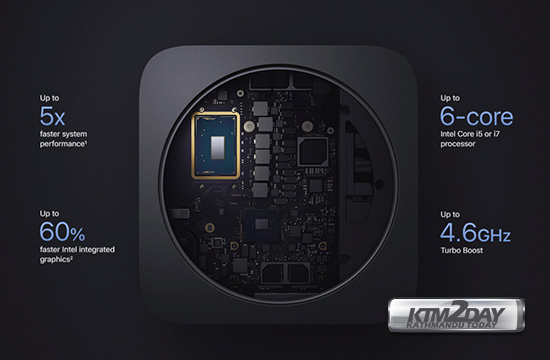 Apple has put several I/O ports on the all-new Mac mini, with four Thunderbolt 3 USB Type-C (v3.1) ports (twice as many as the previous generation), one HDMI 2.0 port, two USB Type-A (v3.0) ports, an audio jack, and Gigabit Ethernet, with a 10Gb Ethernet option. 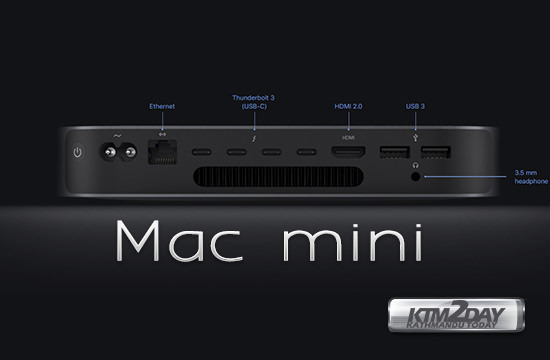 With the ports, the Mac mini supports up to 4K and 5K Thunderbolt displays. Let’s detail the two SKUs offered by Apple – both of which will come in Space Gray colour variant. The $799 base model sports a 3.2GHz quad-core Intel Core i3 processor, though users can configure the same machine up to a 3.2GHz 6-core Intel Core i7 (with Turbo Boost up to 4.6GHz), 8GB of 2666MHz RAM (with configuration options of 16GB, 32GB, and 64GB), 128GB of SSD storage (options of 256GB, 512GB, 1TB, and 2TB). The $1,099(~ NRs.1,30,000) Mac mini model sports a 3.0GHz six-core Intel Core i5 processor (Turbo Boost up to 4.1GHz), though users can configure the same machine up to a 3.2GHz 6-core Intel Core i7 (with Turbo Boost up to 4.6GHz), 8GB of 2666MHz RAM (with configuration options of 16GB, 32GB, and 64GB), 256GB of SSD storage (options of 512GB, 1TB, and 2TB). All of the new Mac mini models come with Intel UHD Graphics 630, and support up to 3 displays. Wireless connectivity options include 802.11ac and Bluetooth v5.0. It weighs 1.3kg, and measures 197x197x36mm.